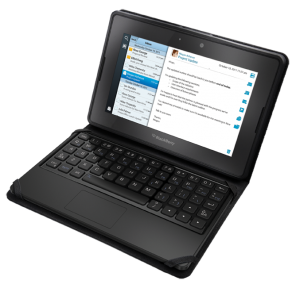 Research In Motion recently announced a new mobile keyboard solution for the PlayBook that turns your BlackBerry tablet into a netbook. The BlackBerry Mini Keyboard features a 7.6-inch wide Bluetooth keyboard with a touchpad and carrying case priced at $120. Accessory makers already offer similar protective cases, keyboard stands and pint-sized Bluetooth keyboards that complement RIM's 7-inch PlayBook. But this accessory has the official blessing of RIM, a stance that may be important to some users. The BlackBerry Store is accepting online pre-orders for the Mini Keyboard and shipping starts March 23. The biggest advantage to the PlayBook's mobile keyboard set-up is that you don't have to use the onscreen keyboard and can dedicate more screen space to your apps to get some serious work done. The Mini Keyboard runs on its own battery power, and RIM claims it can last up to 30 days on a single charge. The Mini Keyboard's touchpad uses limited multi-touch functionality to offer right and left mouse clicks and two-finger scrolling if apps support it. The device's Bluetooth connection relies on 128-bit encryption to keep hackers from watching your keystrokes as you type. RIM envisions that the Mini Keyboard will come in handy for enterprise users who rely on Citrix Receiver to access a virtual Windows desktop through the BlackBerry tablet. Average consumers, however, won't be able to take advantage of this service. OnLive Desktop, a virtual Windows app available to single users on Android and the iPad, does not yet officially support the PlayBook -- although the more tech savvy could try sideloading OnLive's Android app as a workaround. RIM recently enhanced the functionality of the PlayBook with a software update that added an e-mail client, long-awaited Android app support, and improved Docs to Go functionality.